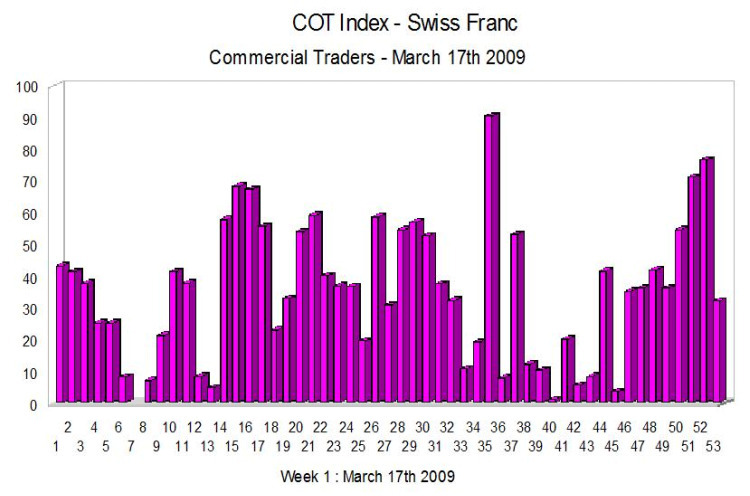 The COT data for the Swiss Franc is relatively interesting inasmuch that it is rare that it reaches the extremes of 90 and above. Also I tend to look at this data when trading the euro Swiss and not the Dollar Swiss. Up until 2 weeks ago when the Swiss National Bank announced that it would actively intervene in the markets we could have used this data with more confidence. In addition the FED’s decision last week to buy Treasuries and mortgage backed securities which prompted a massive fall in the US dollar has also clouded the picture and in order to draw some meaningful conclusions from the COT for the Swiss Franc we may need to wait a few more weeks for the picture to become clearer once again. All the latest fundamental news is now available in the economic calendar.